Two cousins. One city. So much food. My beloved cousin Claire and I recently found ourselves in Paris. Between my food obsession and her passion for art, we were quite the pair. Some of the many highlights to the trip included an unexpected gallery tour of the Louvre as a result of Claire’s recent acquisition of Masters in Art History and stumbling into an underground jazz bar filled with Parisians dancing the night away. 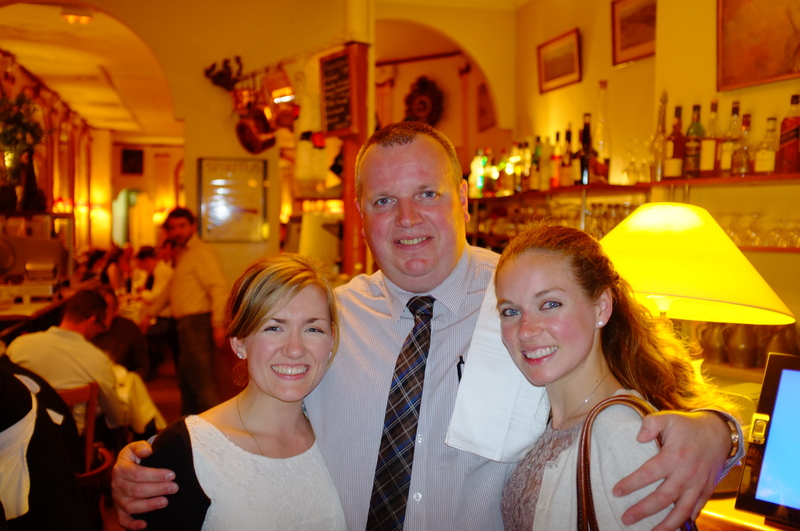 However, one of my favorite food experiences was dining at the forever famous Chez Georges. Call it cliché if you must – even typical tourist behavior – but I don’t care. There’s something just wonderful about cliché French food – croissants, Madeleines, pot de crème, duck à l’orange. It needs no reinventing. It just is and forever will be delicious. 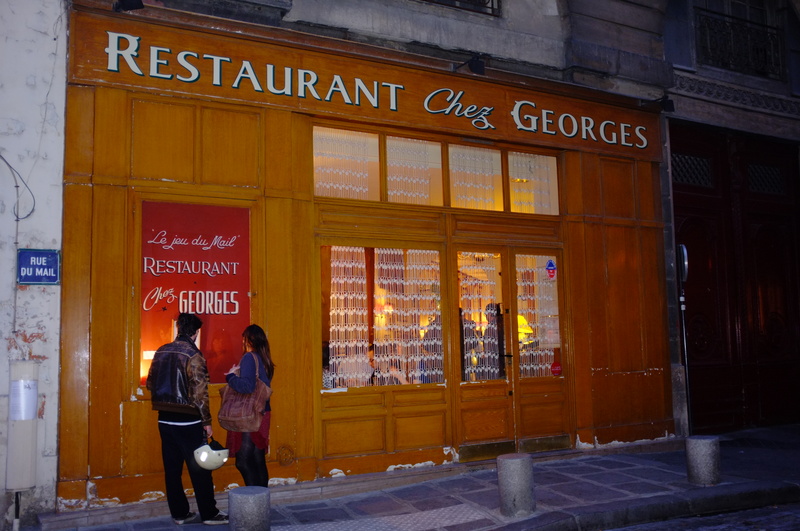 Chez Georges is the old haunt of many a renown chef and was reportedly Julia Child’s favorite restaurant in all of Paris. With its oak entrance, dim-lit sconces and untouched lace curtains, patrons feel like they are stepping back in time to enjoy la cuisine traditionelle. 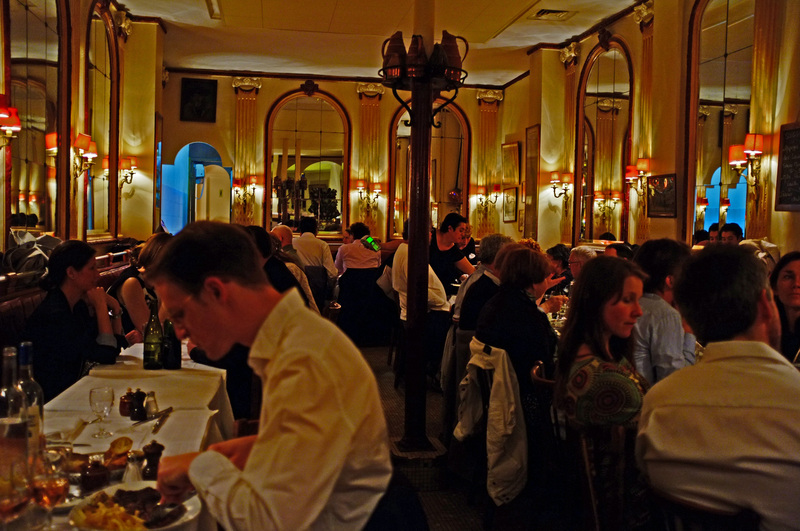 The restaurant first opened in 1964 under Georges Bruillet and hasn’t lost an ounce of charm or flavor since. Claire and I went all out. We admittedly spent about 20 minutes reading the handwritten (yes, handwritten) menus and another 10 translating the dishes that appeared interesting to our not-so-refined French language skills. Cecile – our rough-around-the-edges server who warmed up to us after 2 hours of culinary extravagance – must have checked on us at least 5 times before we were ready to order. Sadly, most of my pictures from this evening were lost. I began my meal with the Salade frisée aux lardons (frisée with fatty chunks of bacon, shallot vinaigrette, and an egg). Never in my life have I had an egg so perfectly poached. 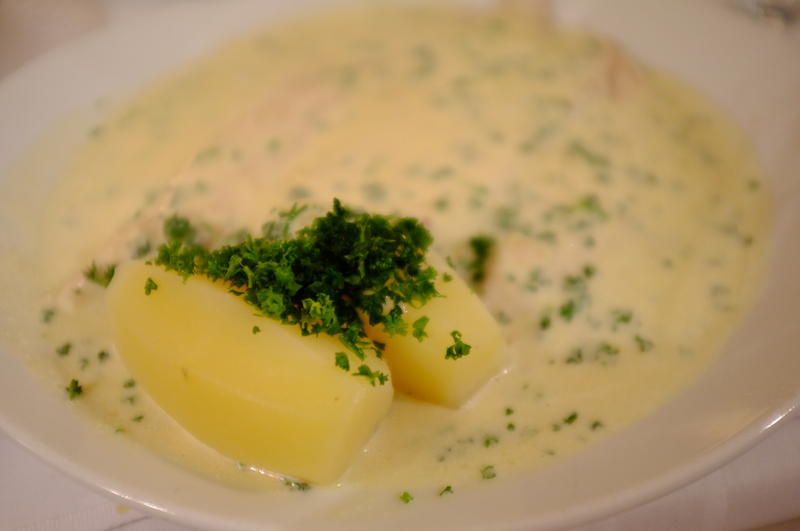 For the main course, we both indulged in the Sole Meunière – a fillet of sole just smothered in butter, cream, chives, and other heavenly goodness that melts in your mouth. And you’ll never forget the potatoes that cut like clouds with just the slightest push of a fork. Finally, for dessert, I indulged in the Tarte Tatin. Tarte Tatin is just as traditional as American Apple Pie. Caramelized sugar that boils up through hunks of apple, topped with flaky butter pastry, and turned out of the pan is hard to beat. I expected nothing short of amazing from Chez Georges, but it was the full 10-inch wide mixing bowl of Chantilly Cream that they placed in front of me that did my taste buds in. You haven’t had Chantilly Cream until you’ve had it at Chez Georges. Somehow, theirs came out looking like a huge batch of crème frâiche but was about twice as dense, solid, heavy and flavored with strong scents of vanilla. I tried not to smother the generous slice of tarte before me, but it was no use. I found it. The perfect French cliché of a dessert that satisfied every whim of an American in Paris. I hope to find myself back in that beautiful city someday soon. Until then, I’ll be dreaming of Chantilly Cream and idling away my days creating Tarte Tatin to make it through. 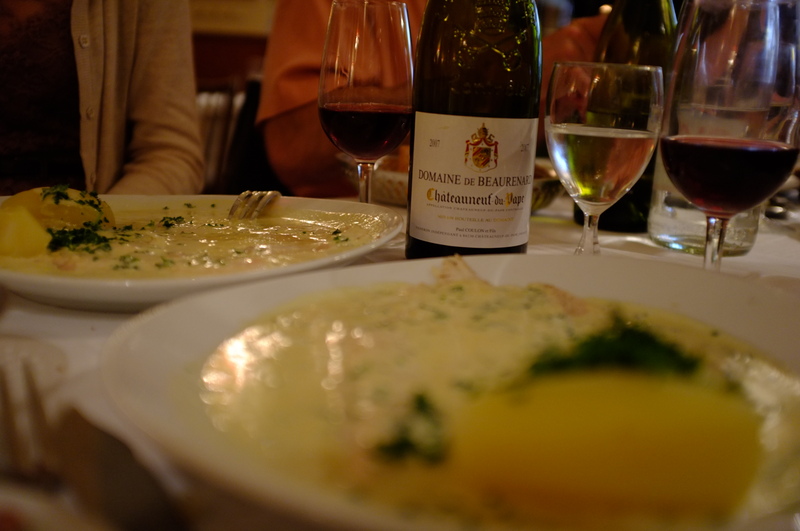 You’ll learn quickly that there are several Chez Georges in Paris – all entirely different establishments. We visited Chez Georges at 1 rue du Mail near Bourse. If you plan to go, make a reservation in advance.